These are some quick photos I took when I came back from Brick Lane of this (not sure what kind of print it is) shirt I bought in Rokit. 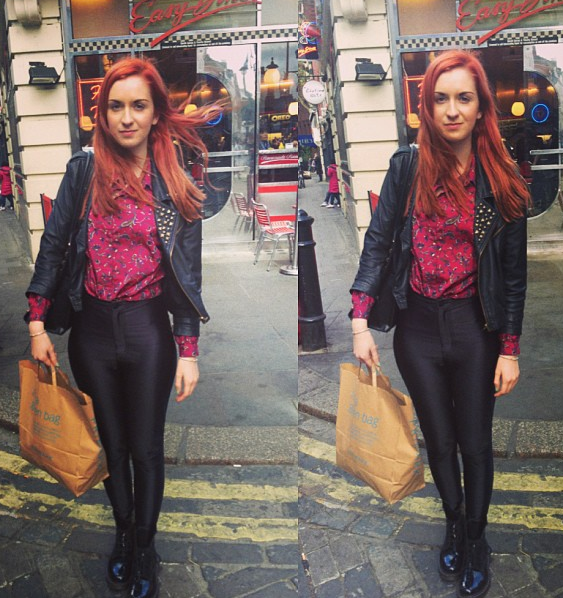 I also added a photo at the top of when I wore the outfit to uni the other week with disco pants and docs! I’m thinking maybe a midi or shorts may also go great with it. The shirt actually has 11/12 printed on the label so I’m not sure if it means 11-12 years…surely not? People have been saying to me recently that they have noticed that I have lost some weight but I haven’t lost THAT much! hahaha! I’m wearing those trusty Primark heels again which I seem to have in EVERY outfit post recently! I wore them for about 10 hours recently without the need to change, they are that comfy and I haven’t fallen over in them…yet!